It provides us with financial flexibility. When something goes wrong with my car, my used car, it’s usually something big. Gone are the days of simple oil changes every 8,000 km. A healthy cash emergency fund allows us to combat any car failure and/or weather a different expense around the house. It keeps us out of debt. While it’s true an emergency fund will eventually run out if you spend it all, the same can be said about a line of credit (LOC); these things aren’t a bottomless pit. Contrary to how some people treat their LOC – it’s not your money – the line needs to be paid back. An open line of credit is a liability. In a small emergency situation, the last thing my wife and I want to do is to add-on more debt. I’d rather focus on the emergency. Besides we have enough debt to worry about with our mortgage for the next five years. It keeps us in control. Further to using a LOC as an emergency fund, we’re not in control if we tap into it, the bank is. The bank determines our borrowing rates and payback criteria. Borrowing policies and procedures change. I don’t want to be left holding any more bank debt than necessary. We will never be immune to those “what ifs” in life. $hit happens. No matter how stable things seem or how good our health may feel, we’re not immune to the realities of life. When the stuff hits the fan I know I have no predictive power in knowing how long we’ll be stuck in that crisis. It could last days, weeks or even months. Who knows what the future might bring. Having a $10,000 emergency fund is a decent security blanket for us that will cover some expenses for a short period of time if something pops up. For years we always had some sort of cash emergency fund but not as much as this goal. It took us a few years to get here but we made it. There is an opportunity cost with any cash buffer but our piece of mind is hard to put a price on. 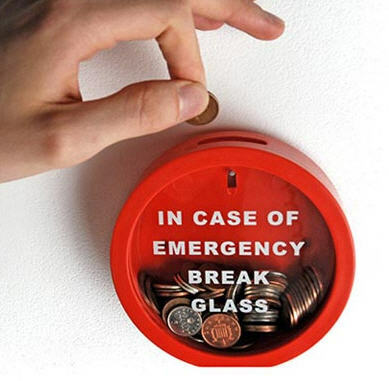 What’s your take on emergency funds? Got one? Don’t care for one? 36 Responses to "We did it – why we have a $10,000 emergency fund"
Congratulations on your ‘oh sh!t’ safety net! Ha. Yup, that’s exactly what it is – the oh $hit fund. Great job reaching this milestone! I’m just curious, do you keep this at your bank’s “high interest online” type account for a quick transfers? Or do you have it separate in an with a tangerine/EQ type account where a 24 to 48 hour delay may occur? Also, have you considered holding in a short term government or corporate bond fund instead of straight cash? 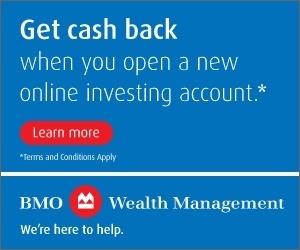 I use BMO’s short term corporate as a my personal cash equivalent… Decent yield around 3.5% with minimum volitility. Thoughts? Thanks TrueNorth. We keep this cash in a high interest account – very liquid this way, which fits the definition of needing money (quickly) in an emergency. I have considered using bonds but I prefer to keep some cash, and everything else is invested for the long-term. The problem I have with corporate bonds are you need to sell them to get the money. Good for you Mark! Too many people use their LOC thinking it’s just a backup, but end up as you suggest, an on-going debt. I keep my cash funds in Tangerine. Small but at least some interest. I think an LOC is OK but really, if you’re in a short-term emergency do you really want to be paying more interest? Personally, my answer is “no”. Tangerine have some great accounts – progressive bank. A few yrs ago, I was paycheck to paycheck, but then wised up, and started an EF, putting some away each pay period. Now thankfully am up over 4 mon the ofirst expenses. Great to have that peace of mind, not worrying about some financial emergency around the corner. 4 months is very good Kenny. That’s probably a great piece of mind for you – well done. We don’t call it an “emergency fund” but we do keep some funds easily available. If a big emergency came up I’d just use the HELOC which hasn’t been used to any great extent in the past 15 years. Having said all that, we do keep 1K in a local credit union daily interest savings account that I can use a debit card on. I have used it once when my credit card lost it’s brain. We also keep 2K in the chequing account to maintain a “free” account. There is also 9.7K sitting in another credit union daily interest account and we each have three, 5K GICs maturing for each of the next three years. And last but not least there is always the TFSAs with the RRSPs as last resort. I do sleep better knowing I can always access some cash. It sounds like you have some good cash / fixed income buffer Lloyd. I just think that’s smart money management but I’m biased. Nice to have reached your target size of an emergency fund. We have one as well. Agreed with all your reasons to hold on to one! Ours is probably too big… We have an outright emergency fund, then a life happens fund where we put away money each month to buy bigger itmes like outdoor lightning, furniture for the kids rooms,…. We all have to do what makes us sleep at night! That’s the thing eh Amber Tree – whatever you feel you need to cover emergencies – that’s the amount you need. Thanks for reading and for the support. I don’t blame you one bit for stashing away that much cash. People have often asked why we keep so much in our emergency savings and projected expenses bank account and for the many reasons you listed. Thanks Mr. CBB. It took us a few years but we’re at a comfortable-level now just in case something pops up. Life does that now and then. We dont have a true EF but we keep checking account balance between 5k and 15k all the time (8k-12k 90% of the time). @LB: With that much in chequing you might consider putting most in a Tangerine savings account. They pay only 0.8% but that would be about $75 a year. Easy to transfer funds back & forth to chequing. Tangerine and PC Financial are great no-fee accounts. Good reminder cannew. That’s pretty good Le Barbu. Well done. What’s the interest rate on your savings account? Be sure it’s higher than your personal inflation rate or you’re losing purchasing power every year. SST, what is your take about EF? How much liquidity is enough (nominal or months of expenses) and where do you keep it? We have a 3-month cash EF fund, enough to cover basic necessitaties. Chose the duration because in the event of job/income loss, it could take 3 months to start receiving government payments. It’s kept in the form of ‘under the mattress’ cold hard cash, topped up yearly to account for inflation. 3-months is very good. I suspect in the years to come we’ll top it up higher to account for inflation as well. Potentially our goal for 2017 is $11k. That way we keep our purchasing power over time. It’s only 3 months, and no more, because i) you should be able to sort out most “emergency” situations in that time (e.g. liquidate the illiquid etc. ), and ii) if any emergency lasts longer than that (e.g. Fort Mac, Hurricane Katrina, Prez Trump), you’ll need a lot more than just cash. Great Job on the 10k emerg fund. Loc is a bad idea for emergencies as more debt really adds more stress to the situation. My spouse and I have 40k as an emerg fund. We are trying to get it to 60k which would cover our expenses for a year and a half. If we don’t use it we’ll consider it a cash wedge for retirement as a buffer for bad stock market years when we don’t want to sell stocks in a down year. These are financial ideas everyone should should think about for building in financial security long term. That sounds like a great amount Robin. Very well done. I see what you’re saying about the cash wedge. We’d like to have the same 1-year cash wedge buffer at time of retirement – that just makes sense. Congratulations, $10K is the same amount I’ve set aside for an emergency fund as well. It seems like a good balance between having a bit of a purely liquid safety net but at the same time not losing market opportunity. I just can’t imagine putting $50K sitting in cash, unless I was close to retirement and with at least close to a 7 figure balance…. I can’t imagine that much either CalgaryPotato. Unless I was retired, a good cash buffer would be good then, $25k – $50K or so, with a 7-figure portfolio. First off, congratulations on meeting your savings goal! Now for some comments. I think the emergency fund debate is very dependent on your situation (jobs, family, debt, lifestyle, etc.) and there is no wrong answer as long as you have a plan in place. When my wife and I first started saving after we purchased our first house, I focused on the emergency fund and hoarded about $10k away in a TFSA that made probably making about 3%. Then a year later, that rate dropped to 1.5% and I found another place that offered 2.5% and transferred it there. After a couple years later, the rate slowly trickled down to 1.75% and I again transferred it to another account for 2.25%. Then within a year, the rate dropped again to below 2% and I got annoyed at the constant cycle of trying to find the best rate around. 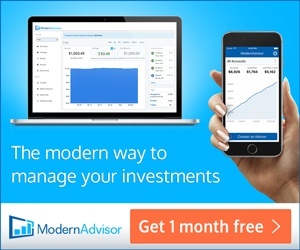 All for a couple basis points on something that isn’t earning much at all. That got me really thinking about what are we going to use this cash for. We have two cars paid off, our only debt is a mortgage, we always keep a savings account that fluctuates between $5k-10k as we save and pay for things like trips/large items (snow blower, lawn mower, canoe, bikes, etc. )/house improvements/kid expenses, and we always have about $5k of cash in different accounts throughout the year as we save for yearly RRSP contributions, RESP contributions, and an extra payment on the mortgage principle. On top of all that, I’m in the military so my job is fairly secure and I know we can live off that if my wife loses her job (…baby years). So, I took the $10k that was sitting in our emergency fund and dumped it on ETFs (split evenly amongst fixed income/Canadian equity/US equity/International equity) and now I look at the combination of the other saving accounts as our “emergency fund.” Also, I was able to open a HELOC through my bank when they offered it without administration fees. If $hit hits the fan, then I expect that means no trip that year, or maybe for a couple of years, or we don’t pave the driveway one year, maybe we don’t put money away in my wife’s RRSP account when she is looking for a job, or maybe the RESP accounts go without a couple years of maxed out RESP contributions because mommy and daddy had to fix the roof one year, or maybe we use the LOC and that means our aggressive mortgage payment plan is put back a couple years….the list can go on. I guess the point of all this, is that if you have a plan then you have solved 80% of the emergency fund question. Also, I feel I should point out that my wife and I are only 32 and we worked really hard at being financially conscience to get where we are today. We didn’t eat KD for years or work 10 different side jobs, we enjoyed life but spent and saved within our means. Maybe that is the key to answering the emergency fund question. Plan to only spend and save within your means and your “emergency fund” will grow as you grow older. Thanks for the detailed comment rj! Agreed, an emergency fund can be very dependent on your situation/lifestyle/monthly burn rate but I think it’s important for us to have a plan in place. Our TFSA is maxed out like a retirement account (full of stocks) so we don’t consider than an emergency fund. Congrats on two paid off cars and only mortgage debt – that’s pretty good. Your last point about spending within your means is of course – correct and good practice. Most of us can’t afford to spend more than we make! That’s fair. I know we sleep better having a bit of cash tucked away and eventually, we’ll have more, as we march to retirement age for our cash wedge. Fair enough 🙂 Everyone has their own safety blanket size – ours as we march towards early retirement is definitely a decent cash buffer. Thoughts on this? I encouraged my boyfriend to start an emergency savings of 10k. She saved 7k before he got laid off. Before that he might have saved 2k and called it a day. That money has helped him move to a different province and learn a new skill that’s highly coveted and profotable in his trade. He also had his car insurance and car repairs for his out of province inspection that he had to cover, his damage deposit and living expenses while employment insurance kicked in. He didn’t have to borrow money or use his credit card to do any of this . Would most people have been able to do what he did without borrowing money? I doubt it. So even though there are opportunity costs with having an emergency fund there are also opportunity costs for not having one. Good story and input Polly. Thanks for that.